With much siyatta Dishmaya, our community has grown exponentially. Orthodox communities are thriving and the quantity and quality of Torah education — yeshivos, Bais Yaakovs, kollelim — surpasses all reasonable expectations. Likewise, the breadth and depth of chessed — on an individual and organizational level — is a source of pride to our community. Yet we are not without serious challenges. Rather than analyze, criticize, hypothesize or propose solutions to the complex issues we face, let us accept the fact that we live in the twenty-first century and are deeply affected by the outside world and its influences. How tempting it would be to deal only with the simple challenges, and sweep complicated and painful issues under the proverbial rug. Instead, in this new column, we seek to lift the curtain on the day-to-day activities of heroic individuals — whether voluntarily or professionally — who give their lives to address specific issues facing our community. With great sensitivity, we will present glimpses of situations both heartrending and heartwarming . We believe this column will be transformative. 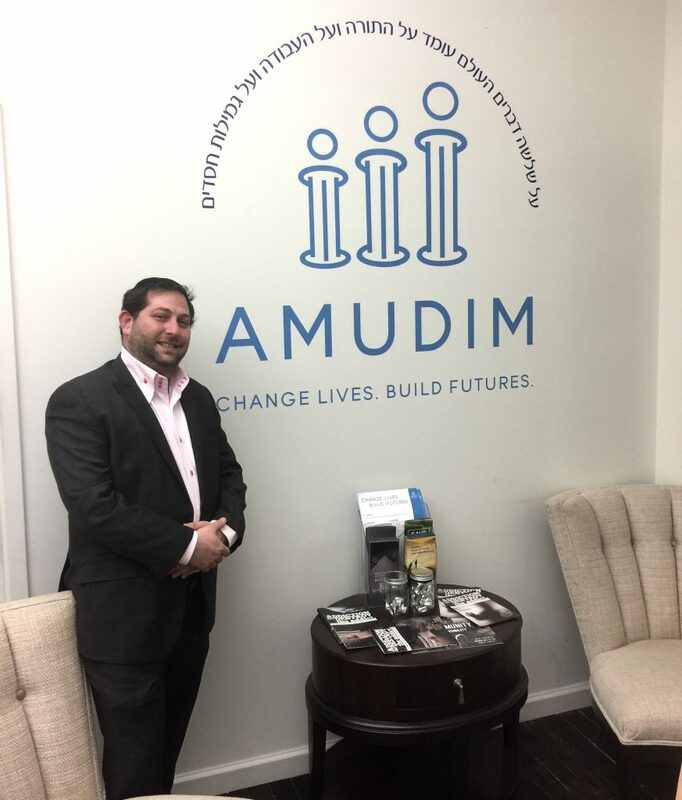 The first in this series is Amudim, an organization that assists victims of childhood abuse and drug addiction, whose life-saving work you’ll experience by joining our reporter as he followed its director, Zvi Gluck, for a full day in the office. It’s just a few minutes after 8:00 a.m., but Rabbi Zvi Gluck has been awake for well over two hours and is already on his second cup of coffee. He’s had only four hours of sleep. In other words, it’s a fairly typical morning in the life of the Amudim director. We meet on this brisk Thursday morning at Zvi’s home in Queens for the drive to the Amudim office in Lower Manhattan. An Amudim staffer named Moe will do the driving today. Zvi cannot drive himself, as his work, involving nonstop phone calls, emails and texts, begins during the morning commute (and often, long before). Even before Moe starts the engine, Zvi is on his phone. His first call is to a police sergeant whose officer has just arrested an Amudim client. After exchanging greetings, Zvi finds out the charges against the client, closing with some friendly conversation. “Hope to see you soon,” he says. Chunks of hail pelt the windshield as Moe turns onto Queens Boulevard. Calls come in about two new cases. One involves parents going through a brutal divorce that is having a destructive effect on their children. “Amudim usually doesn’t deal with divorce cases,” says Zvi. 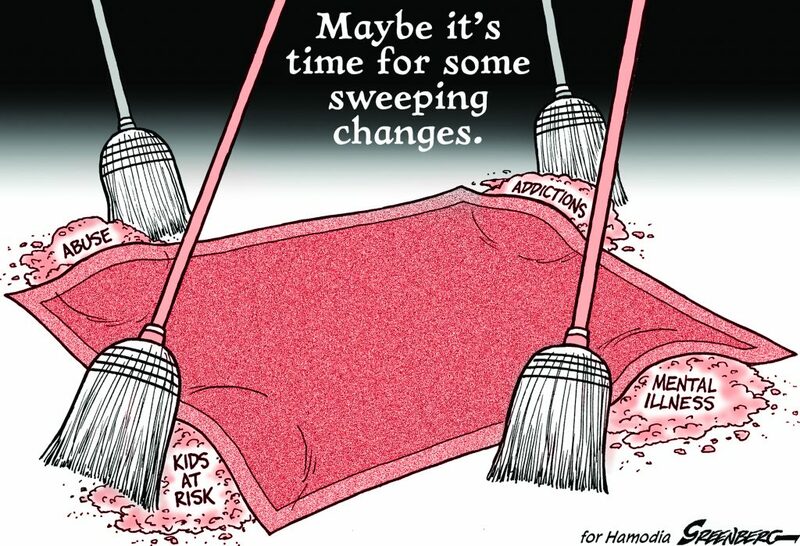 But in certain unique circumstances, where the potential for trauma is great, he’ll get involved because, after all, if he doesn’t, “these kids may anyway wind up becoming Amudim clients one day.” In his experience, children whose parents went through acrimonious divorces are at particular risk for substance abuse. It is challenging enough for children to come to terms with the new reality of divorce and its various ramifications on their lives, but watching their parents being cruel to one another totally destroys their sense of security and self esteem. “It’s extremely important that parents learn how to co-parent even when they’re divorced,” suggests Zvi. The second case involves a 20-year-old who was abused as a very young child by a teenager; unsurprisingly, this is causing significant problems with the victim and with his relationship with his family. Each case will be referred to one of Amudim’s case managers, who will work to get the parents and children into therapy. Moreover, Zvi has just realized the need for a brand-new Amudim project. As the SUV exits the Queens Midtown Tunnel and heads toward the FDR Drive, Zvi receives a call about a tragic matter related to his work in another organization, Chesed Shel Emes: A man has, R”l, been killed in a car accident in New York, and arrangements must be made to get the body released quickly from the medical examiner’s office for a levayah, a flight booked to Eretz Yisrael for the aron and an urgent passport made for a relative to accompany it. “I just texted the medical examiner; as soon as I get clearance from him, I’ll get back to you,” he tells the caller, and he begins contacting the relevant passport agencies. Zvi arrives at the Amudim office at 11 Broadway at 9:00 a.m. This is a late morning for him; he’s usually at the office by 8:30, at the latest. In the crowded elevator for the ride to the tenth floor, all conversation with Moe about Amudim cases ceases. The trips in the elevator, among strangers, are the only time all day when there is no discussion of Amudim, to protect clients’ confidentiality. Zvi walks through the double glass doors of the Amudim suite and heads to his office. On either side are the offices of his dedicated assistants, Zoe and David. A receptionist’s desk and conference room are also on this side of the suite; on the other side is a large room with cubicles for the case managers and, near a separate entrance to ensure confidentiality, some private rooms for those whose clients wish to have in-person consultations. Settling into his chair at his desk, Zvi opens a can of diet Dr. Pepper (the first of many today) and a bottle of water (he’ll barely touch it), turns on the computer and picks up one of the two telephone receivers on his desk. There’s also a cordless phone, which serves as a third telephone when he is using the other two. A Bluetooth headset sits in his ear that’s connected to his cellphone, which sits on the desk next to his handbag, in which there are three replacement battery packs at all times. (The cellphone, which receives constant pikuach nefashos calls, is on 24/7/365). Next to the main desk is a side desk with two computer monitors. Sufficiently caffeinated and plugged in, Zvi picks up the phone. The first in-office call is about an urgent passport needed for a medical-related transport to Canada. This particular call is not for an Amudim-related service, but for a Zvi Gluck service — the expertise, connections, know-how, and dedication of someone who has spent most of his 37 years helping others. The calls keep coming. From addicts. Their parents. Grandparents. From victims of abuse. Their relatives. Friends. And an extended call regarding a complicated custody battle that will occupy much of his day. A multitasking expert, Zvi often listens to one person’s conversation while listening to another’s voicemail — putting one on pause, picking up another, going back to the first without missing a beat. Amudim’s 11 highly trained case managers deal with clients’ needs from beginning to end, putting them in touch with therapists, arranging for rehab, and much more. But many clients call specifically asking, “Can I speak to Zvi Gluck?” Except in rare and complicated cases that require his personal expertise, Zvi will politely ask the client to state his or her situation briefly before putting him in touch with the appropriate case manager. At 10:00 a.m., Zvi is drinking his third coffee of the day, as he conducts a telephone interview with a reporter from an Israeli newspaper. “There’s nothing like free press,” Zvi says to me, with a wink. Amudim has never advertised, simply because it cannot afford to do so. Its only publicity is in the form of short videos it creates, which have been highly acclaimed and awarded. These videos have generated thousands of calls for help from victims and their families. Zoe enters the office to give Zvi some donation checks she’s received. Zvi asks Moe to go to Brooklyn to pick up a few other checks from donors. These donations are needed urgently; no time can be wasted in waiting for them to arrive in the mail. Zvi places a call regarding an existing case, trying to raise money to transfer a girl who had been abused into a better treatment program. A new case comes in: A member of a heimishe community calls to inform Zvi of a predator in his neighborhood who preys on teenage girls and gives them drugs. Zvi spends a significant amount of time on this case, making notes to hire a private investigator. Amudim was founded just four years ago, but the roots of the organization can be traced back to the mid-1990s, when two of Zvi’s friends died of overdoses. Upon subsequently learning that both had been abused as children, Zvi began to make the crucial connection between childhood molestation and adult substance abuse. The legendary askan Rabbi Chaim Boruch (Edgar) Gluck had always inspired in his son Zvi a desire to help people, and now Zvi began informally counseling abuse victims and addicts. Finally, in the spring of 2014, Zvi founded Amudim with three staffers (including himself), and an initial annual budget under $400,000. Phone calls started pouring in, and a case-management staff was developed. In 2015, Amudim held a conference in Newark, New Jersey, attended by over 350 principals, Rebbeim, philanthropists, therapists and social workers. Soon thereafter, Harav Elya Brudny, shlita, Rosh Yeshivah in Mirrer Yeshiva of Flatbush, who had been involved with Amudim from its inception and was one of the speakers at the conference, became the organization’s Mara d’Asra, upon the encouragement of Harav Shmuel Kamenetsky, shlita. The 2015 Amudim budget was $1.3 million. By 2016, it had jumped to $2.5 million, and last year it was $3.4 million. The organization’s projected budget for 2018 is $3.8 million. Amudim receives approximately $300,000 of government funding (though that can swing wildly from year to year) and $1.7 million from grants, foundations and a core group of donors, among them Directors Mr. Moshe Wolfson and Mr. Mendy Klein, who contribute generously on an annual basis. Around $1.5 million needs to be raised door to door, phone call to phone call, campaign to campaign. And that’s just for the U.S. office. Amudim has just opened an office in Yerushalayim, under the guidance of Harav Yosef Elefant, shlita, R”M in Yeshivas Mir Yerushalayim, primarily to serve American yeshivah bachurim and seminary girls. The projected budget for the Yerushalayim office — which opened dozens of cases in just its first two months — is $1 million. There’s another branch of Amudim in Israel that serves the Israeli population, called Amudim Igud Hakehillot. This branch is under the guidance of Harav Baruch Soloveitchik, shlita, and Harav Dovid Cohen, shlita. The financial numbers for Amudim are grim, but the human cost of abuse and drug addiction is even grimmer: In 2017, there were 177 overdose deaths and 51 suicides, by children and adults under 35 who grew up in heimishe communities across America. In just the first few weeks of 2018, there were five overdoses and two suicides. Amudim’s caseload has soared, as illustrated by just one year-over-year example: In January 2016, Amudim fielded a total of 3,813 phone calls and opened 84 new cases; in January 2017, the numbers were 7,478 and 130, respectively. While many see the rising number of cases as alarming, Zvi insists it is a positive sign. “This means people are not afraid anymore to call and ask for help,” he says, noting that many new reports of abuse are occurring with younger children than before, indicating that parents are reaching out for help earlier than they did previously. Amudim dealt with 441 victims of childhood abuse in 2017. Many of these victims keep it a secret until they are teens or adults. Significant numbers of these victims will likely turn to drugs; their mental-health or addiction issues may cause their parents, siblings and children to suffer. Often, entire families will have to go through intense therapy, for which Amudim may have to raise money. While parents may wish to shield their children from the realities of a dangerous world, Zvi feels it is imperative that parents discuss these issues with their children when they are young, so that they have the proper understanding of the dangers before they arise. Even young children can understand and process the issues if the conversation is held in an age-appropriate manner. At 11:00, Zoe and David enter the office to discuss the schedule for Amudim’s upcoming staff Shabbaton — its first retreat of any sort — to be held at a suburban New York hotel. Rav Brudny has urged that this Shabbaton be held, essential to reinvigorate the dedicated and overworked staff. The meeting is interrupted by several calls, of course: a fundraising call for therapy for a woman, herself the victim of abuse, who later witnessed a friend’s suicide; and one involving, yet again, a divorce case. For several hours each week, Zvi meets with leaders of various struggling organizations seeking guidance. Today’s meeting is with Rabbi Shmulie Brown, who runs the “The Chill,” a five-year-old organization for children at risk in Passaic. The Chill hosts around 15 boys at its drop-in center each night, providing entertainment, hot meals and a listening ear. Rabbi Brown notes that today one has to constantly keep up with changing issues involving kids at risk — and all kids, many of whom are obsessed with social media and materialism. Rabbi Brown and Rabbi Gluck discuss various ways that The Chill can improve its fund-raising, as it continues its vital work on what is currently a shoestring budget. Despite the craziness of the schedule, the multiple phones ringing at once, and the severity of the issues that come across his desk, Zvi remains remarkably calm with clients, and treats his staff with utmost respect. It is clear that there is much mutual admiration. Zvi says he looks forward to the day he can pay his staff more generous salaries. It appears that his inability to do so now pains him far more than it does them. But at the moment, times are tough — very tough. Yet Amudim never charges for its services and will do whatever it takes to get a client the best help it can. Amudim provides free therapy for its employees and their spouses, to assist with their own stresses of dealing with heartbreaking cases day after day. Shortly before 3:00 p.m., Zvi eats a slice of pizza and two garlic knots, washing it down with a diet Dr. Pepper, his one meal until he gets home late at night. I am assured by the staff that this is highly unusual; on most days, he simply does not eat at all, seemingly subsisting entirely on caffeine. On some nights, he does not even get the four hours’ sleep he had last night. Just last week, he got an urgent call about a client having an adverse drug reaction and was with the boy and his parents from 1:00–5:00 a.m.
Zvi’s wife, Aviva, and their four children, are truly partners in his lifesaving work, giving up a normal family schedule for this most noble mitzvah of hatzalas nefashos. “I think you need some more staffers and to delegate more responsibilities,” I reply. “Because no one else will,” he replies, as he answers a ringing telephone. During the next couple of hours, Zvi deals with the Israeli consulate, obtaining emergency passports for urgently needed travels and discussing a potential kidnapping incident involving an adoption. He works on arranging therapy for two boys addicted to drugs; the brother of one of the boys died of an overdose. Zvi inquires about the progress of a music studio in the works for the Yerushalayim office, which aims to keep the clients occupied in a productive setting by teaching them how to mix music. At 4:55, he dials someone who had been waiting for his return call since 8:20 a.m. As Zvi promised the man, he returned the call the first free moment he had. It’s after 5:00 p.m. now, and the frustrations over fund-raising failures are beginning to boil over. The Amudim caseload has expanded exponentially over the years, but the donations have not kept up the pace. Zvi is disappointed that some philanthropists do not recognize the importance of Amudim’s work. Typical organizations will often receive donations from families, particularly wealthy families, whom they have helped. In the case of Amudim, many do not donate or want to be associated with the organization in any way, as it may represent a dark chapter that the family wishes to forget. It’s 5:30 p.m. 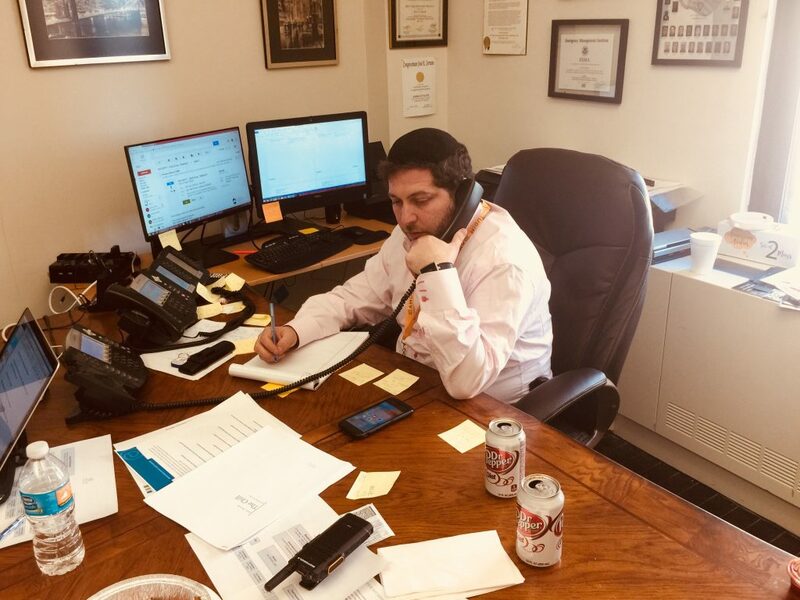 Most employees are leaving now, but no such luck for Zvi Gluck, who swigs from another caffeinated beverage as he participates in a conference call with askanim regarding the divorce case that has been occupying his attention for much of the day. This particularly sensitive case will require asking Rav Brudny a she’eilah in regard to the appropriateness of raising funds for an uncooperative client. When the conference is over, Zvi returns another phone call. He makes an effort to return the phone call of every person whom he’s told, “I’ll call you back,” before he leaves the office each evening. Sometimes, there simply is not enough time in the day, and people have to wait a day or more. This call is to an old friend, a mental-health professional whose own son wrote a suicide note but has also been telling people he wishes to attend a certain yeshivah. “If this were any other child,” Zvi tells the doctor, “you’d be able to see the answer clearly. But since you are too close to this, you can’t. “I want to hug you,” the relieved parent blurts out. Throughout this day, the Amudim office fields 128 incoming calls and places 148 calls, in addition to the dozens of cellphone calls Zvi answers. At 8:55 p.m., for the first time since he left his home nearly 13 hours ago, Zvi’s wife calls. He’s getting ready to leave the office. He grabs two bite-sized chocolate bars on his way out. I will later learn that he won’t arrive home until after midnight, when he’ll eat a quick dinner before going to sleep, shortly before 1:00 a.m.
On our way out the door, Zvi repeats his earlier question to me. It is a freezing night, compounded by the infamous Financial District wind tunnel. Zvi steps into the passenger seat as Moe pulls up and turns on his Waze app, seeking the quickest route to Queens. We begin saying our goodbyes. Zvi looks at the number, turns to me and says, “It’s a new case.